It’s critical for architects to know how to apply their skills in a Lean-Agile organization and be involved early to help define and support the Lean-Agile transformation. 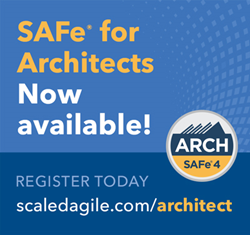 Scaled Agile, Inc., provider of SAFe®, the world’s leading framework for enterprise agility, has announced its latest course, SAFe® for Architects with SAFe® 4 Architect certification. The three-day course explores the roles and responsibilities of Agile architects, and how to align architecture with business value while supporting SAFe program execution. Registration information and dates are available here. As more companies turn to SAFe to meet the challenges of digital disruption, they quickly learn that System, Solution, and Enterprise architects are critical to a successful implementation. Architects help keep business and technology strategies aligned and have a profound influence on how systems are built and maintained. Uniquely positioned between customers who want fast delivery of technologically advanced solutions and the Agile teams who build, deploy, and support them, architects must be able to apply Agile architecture practices that enable continuous value flow. SAFe® for Architects provides a highly interactive, scenario-based learning experience that helps architects explore their roles in SAFe. Attendees learn how to identify key partners, customers, and collaborators in the organization, practice making architectural decisions based on economic trade-offs, and experience shepherding architectural concepts through the entire value stream using Lean-Agile techniques. “SAFe® for Architects gave me the practical understanding and tools to not only effectively lead throughout a SAFe engagement but to align architecture with business value,” said Jeremy Trevatt, Transformation Leader at BrightEdge Partners. The course will prepare attendees for the SAFe® 4 Architect (ARCH) certification exam. Attendees will also receive a one-year membership to the SAFe Community Platform. With the addition of SAFe® for Architects with SAFe® 4 Architect certification, Scaled Agile’s portfolio now includes 11 professional credentials designed to meet the needs of Lean-Agile professionals throughout their career as they practice, consult, or train others in SAFe. Scaled Agile, Inc., is the provider of SAFe®, the world’s leading framework for enterprise agility. Through learning and certification, a global partner network, and a growing community of over 450,000 trained professionals, Scaled Agile helps enterprises build better systems, increase employee engagement, and improve business outcomes. Scaled Agile is a contributing member of the Pledge 1% corporate philanthropy and community service movement. Learn about Scaled Agile and SAFe at scaledagile.com.